About 2.5 years ago we went to a birthday which was out in a paddock on a farm. This paddock had the funkiest tree I've ever seen. It was a huge gum tree but instead of growing straight up it sort of went up and then branched out across the ground in all directions and then turned skyward. I snapped some photos of my big brother and his family and they turned out really well. So for the following Christmas I put them together on a board for a family portrait. 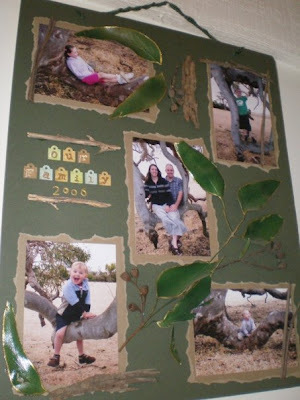 I used photoboard and paper for the background and then decorated it with real gum leaves and gumnuts and bark. I spraypainted the leaves green so they would stay green and also ended up painting their edges with gold paint. It's all just glued together. I put this one together as a "Thanks for having me here" present for my host family last year. For Mar 07-Mar 08 I lived in California, USA and helped take care of these three energetic, crazy boys. A friend took the photos for me. I put them together on a placemat, glueing the paper and photos in place. It also turned out really well. I like this style of photo display because it's much more artistic and interesting than simply photos in a frame. That's such a cool tree. And a great idea for a present. They both look really nice!